By a letter released November 15, 2013 the IRS has confirmed that most recent (and future) California short sales will not generate taxable cancellation of debt income. While this letter was issued in the context of short sales occurring after 2013 the reasoning applies to many short sales all the way back to January 1, 2011 when California Code of Civil Procedure (CCP) Section 580e first became effective. The IRS letter dated September 19, 2013 was a response to one sent from California Senator Boxer but the Senator’s office did not release it until November 15. Both letters are available to free subscribers at the end of this article. 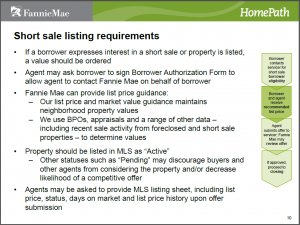 On February 12 I pointed out on this blog how Bank of America was requiring listing agents to lie and violate their MLS rules by keeping short sales as “Active” even after there was a binding contract to purchase the property. It has come to my attention that Fannie Mae appears to be doing the same. 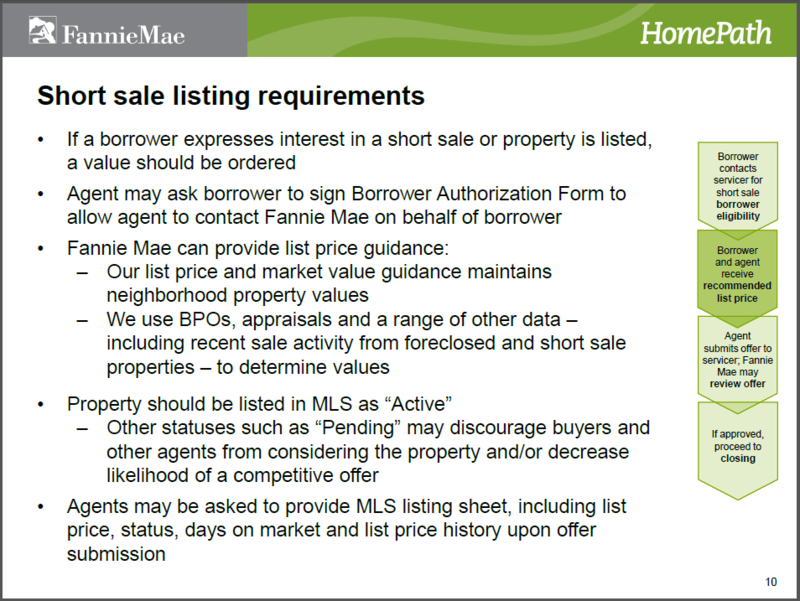 In a webinar hosted with the California Association of Realtors(r), Fannie instructs agents to list a property as “Active,” because “Other statuses such as ‘Pending’ may discourage buyers and other agents from considering the property and/or decrease likelihood of a competitive offer. It took a record short time of less than three days for Bank of America to respond to a groundswell of agent objections to retract an updated short sale listing requirement that appeared to require listing agents to lie and to break their MLS board rules. Whether the February 11 “reminder” was an attempt by Bank of America (which refers to itself as “BANA”) to engage in over-reaching interference in the agent-seller fiduciary relationship or just a poorly worded directive arising out of ignorance is anybody’s guess. All we know at this time is that BANA issued a sensible clarification in less than three days. Not only does an updated Bank of America short sale listing rule require the short sale listing agent to lie, it also dictates that they breach their MLS rules and put their sellers’ property and persons at risk – as well as their license. On February 11, Bank of America (who refers to itself these days as “BANA”) issued an update to its short sale listing rules. The entire update is posted at the end of this article. On November 29, 2012, the FHA extended the waiver of the 90-day “anti-flipping” rule for two years, through December 31, 2014. Last year’s extension was only for one year. You can get the link to the actual release in the Federal Register at the end of this article. Despite all of the hype about the “recovery” of the housing market, the two year extension ostensibly implies that FHA foresees two more years of distress property inventory that will need clearing. Real estate agents (and attorneys) soon will be held legally responsible for reading the corporate mind of Bank of America. Fortunately for everyone else, they will not be allowed to even communicate with Bank of America, much less be required to read its mind. Unfortunately, all of this will further harm distressed borrowers and suffering neighborhoods by discouraging short sales and increasing foreclosures. This all results from a new “Third Party Authorization” form (TPA) which reportedly is mandatory on all Bank of America short sale files as of April 14, 2012. Despite the “professional” statisticians analyzing the distressed property markets, one independent brokerage decided to gather the facts themselves. They concluded that in 2011 bank owned foreclosure properties sold for 24% less than short sales. McGeough Lamacchia Realty, with offices in Massachusetts and New Hampshire, apparently got fed up with all the talk about losses in the market and decided to gather their own facts. Their results are reported at http://bit.ly/A1M8XT . For the last several years private investors buying mortgage notes to facilitate short sales have been a quiet force for effective transactions outside of California. This practice is becoming increasingly more available in California recently as well. What or who is a “note buyer” and how can they help with a short sale? For nearly two years now we’ve heard Freddie Mac attacking private real estate investors who want to buy and resell short sale and REO properties as engaging in “fraud.” They have repeated this lie so much that it is accepted as “true” by many in the residential real estate industry, especially real estate agents receiving “risk management” training — even some law enforcement and regulatory personnel who SHOULD know better have been duped by the constant repetition. The news is abuzz with this “historic” settlement that gives the big banks a big break and does little for consumers. As we’ve seen in the past, the claims in the press releases and sound bites are rarely close to the reality.